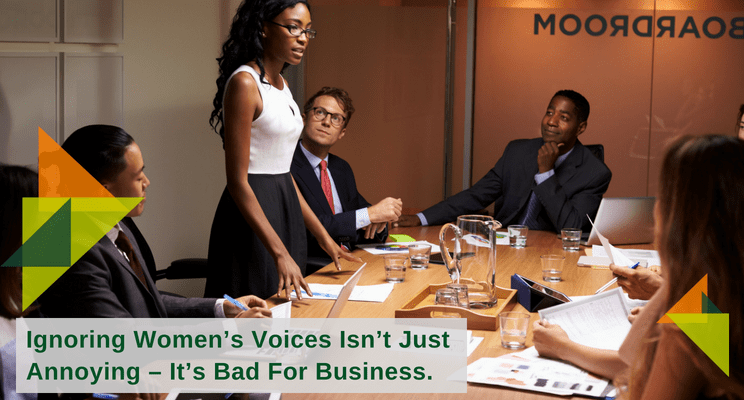 In the course of our work, we hear a similar refrain from women in many organizations that their voices are often shouted over, ignored, or dismissed. They cite as evidence the number of times a man will make a point in a meeting that has already been made earlier by a woman, and the idea is credited as new. There is also a chorus of women who tell us that they get feedback they “use too many words” or story-tell, instead of quickly getting to the point. Sometimes, it’s not just an annoying habit – men ignoring women – it’s outright hubris. Says one engineer on a highly visible project, “I kept raising a critical concern about the project and was dismissed by the otherwise all male team.” When the project failed, they wondered why. Her input could have saved them millions, but they didn’t even hear it, much less seriously consider it. Part of the problem is that women themselves often hesitate to speak up for some reason. It could be confidence – women on average report feeling nearly 20% less confident than men on tasks where their actual performance was equal (Dunning and Ehrlinger 2003). That discrepancy could be attributed to conflict avoidance or fear of rocking the boat. Women who push back are often seen as less likeable and actually less credible than men who push back (Williams 1999). It could even be that women have become jaded – accustomed to being ignored, dismissed, or spoken over so frequently that they have just given up trying. First, notice. Become aware of who speaks up in meetings, who raises issues, and who gets the majority of the airtime. I recently presented to a room full of L&D experts, mostly women with only 4 men in the room. During the limited Q&A time, all 4 men spoke and 3 of them dominated the conversation. Interesting, especially given the topic was women’s leadership development. Second, be proactive. If the women in the room don’t volunteer to speak, ask them what they think. Take the time to probe, question, and listen so you hear the whole story. Practice giving them equal airtime. Third, take their feedback seriously. Resist the urge to dismiss or demote their ideas. If the women on your team are worthy of being on your team, their ideas are worthy of being part of your solution. The best business decisions require balancing multiple perspectives, stakeholder interests, and skillsets. Capitulating to the loudest voice in the room, merely because it is loud, is what leads to groupthink and hubris. Considering and then acting on the advice of the quiet voices can save your team money and even embarrassment.